Shogun. Not sure what model. Has 105 groupset. 73 competition. Is a total repaint. May put it back to origional drop config. Not sure yet. Could also be a repaint in black as it was origionally. Went Saturday to pick up my 73 Raleigh Competition. Was excited and put in the wrong address. The address was 203 and I put in 302. Went to 302 knocked on the door. The nice lady who answered said when asked if David was in "There's no David here. David lives at 309." Apologies nice lady! Went to 309 and rang the bell. Hello David I am Bill. Good to meet you. "Hi Bill, great to meet you also!" Then the crickets started. " I am here to look at the bike" . Dave says " What bike?" Crap. Here we go again. 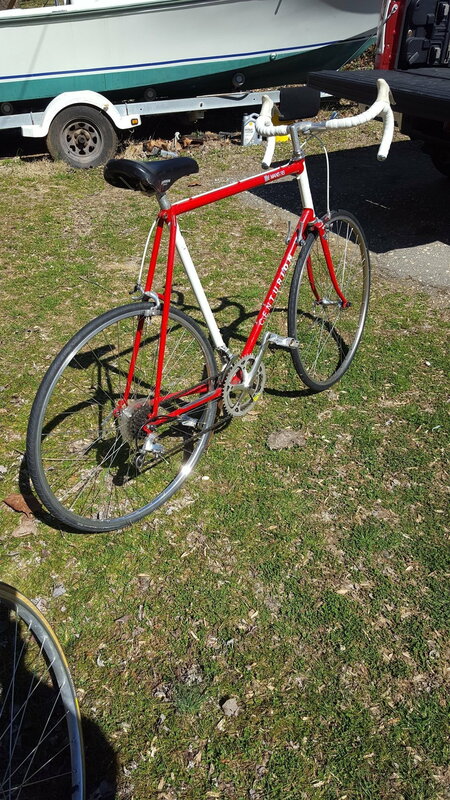 Told him about the Raleigh and he says "Don't have a Raleigh but I got a couple decent bikes, want to see em?" 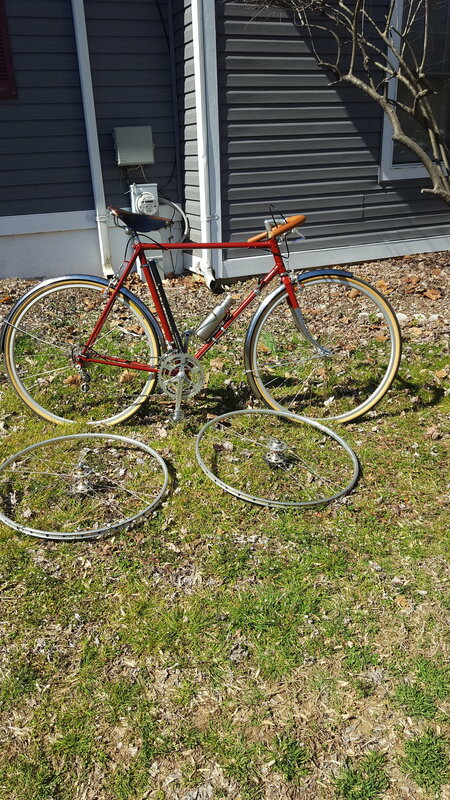 First brought out a real nice condition Centurion Le Mann's RS. 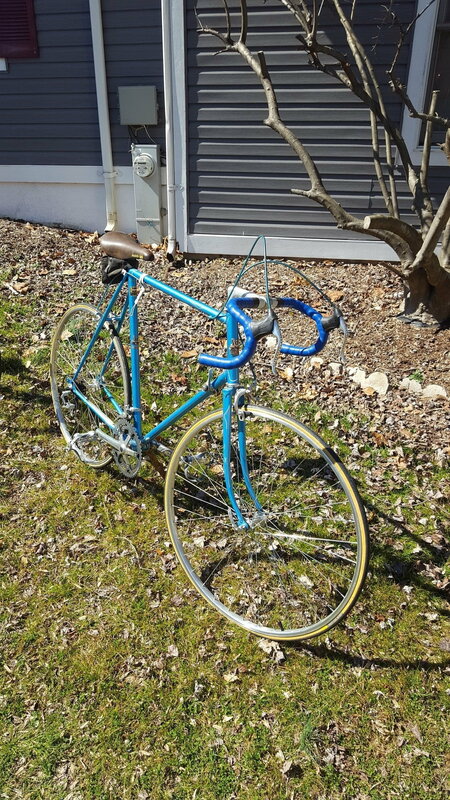 Then Dave says I have a nice blue bike too. Ok, will look. Shogun with 105. Not sure what model but a pretty nice bike also. Then Dave says give your number. I have some Italian bikes in storage. I will call you when I pill them out! We then proceed to the real Dave and pick up my 73 Competition. Very nice! Came with the original wheels and drop bars. Also the how to maintain your Raleigh bike and the Raleigh hat that came with the bike. All in all not a bad day! Last edited by fishboy316; 03-19-19 at 07:28 AM. That's pretty hilarious. Maybe I should go knocking on random doors to try to find my next project? That is great! Mike Wolfe of the TV show American Pickers used to run a bike shop and collect and trade antique bicycles. It was how he got started picking. He has always said that classified ads and flyers never worked. What worked was just knocking on doors and asking if people had bikes or other things they didn't want anymore. I guess people don't have the time to try to find buyers, but if someone shows up to buy them, then perfect! They didn't have to do anything but answer the door. It also makes me realize how my bad my attitude is- I don't want people knocking on my door. Then again, the only times my doorbell has rung it was someone whose car crashed in my yard or they broke down and decided to park in my driveway for the night. Gee thanks! I should have asked for Japanese or Italian bikes in return. Ben Lawee design Univega Gran Touring is here!